Last week I didn't participate in Saturday Snapshot because Denis and I spent the week at our favorite place to relax: Mule Mountain Cottage in the mountains outside of Bisbee, Arizona, just a few miles north of the Mexican border. We indulge in the best pizza either of us have ever eaten anywhere at Bella Roma Pizza in historic Old Bisbee, and we both do a lot of reading as well as pursuing separate interests. I have my "Bisbee Routine": in bed by midnight, up by 5 AM (leaving Denis to sleep as long as he likes), breakfast, and then I set up my observation point just outside the door. Observation point? It consists of a small table with a tray containing a tall glass of raspberry iced tea, a book, and my camera. I top it off with a comfy white wicker rocking chair, and I'm set for the morning. I'll be sitting in the shade until about 11 AM, with a view of mountains, trees, a birdbath, and a hummingbird feeder. I can actually get a lot of reading done out there because-- even though I'm really after photographs of wildlife-- I depend on my hearing more than my eyesight. 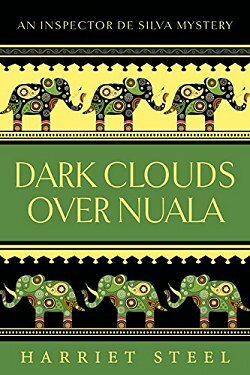 Many critters are so shy that they won't move unless they think my nose is buried in my book, so I read and listen... occasionally moving my eyes above the page without moving my head. One day, my little corner of heaven was like Grand Central Station for many of the critters in the area. The only visitor I didn't get a photo of was a desert cottontail that hopped within three feet of me. If I'd reached for my camera, it would've been off like a shot! 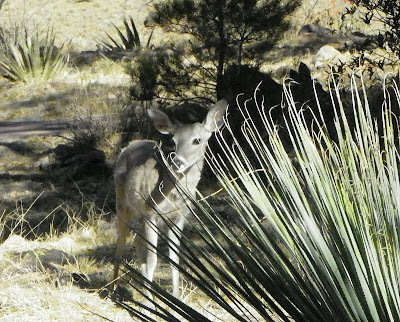 Two mule deer-- a doe and a young buck-- had moved down out of the mountains. 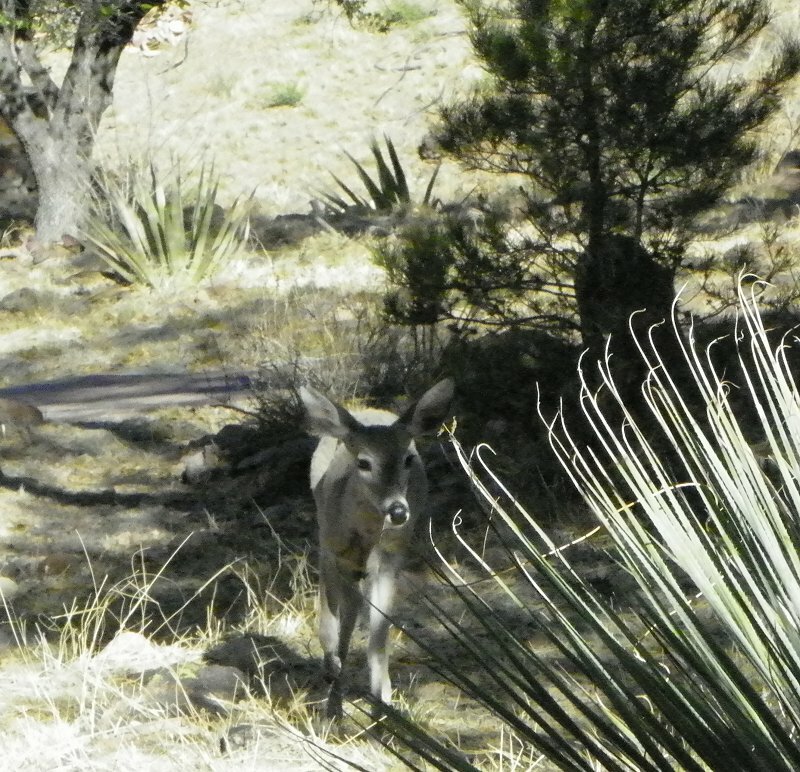 The doe was closest, peeking at me through bushes on the other side of the drive. 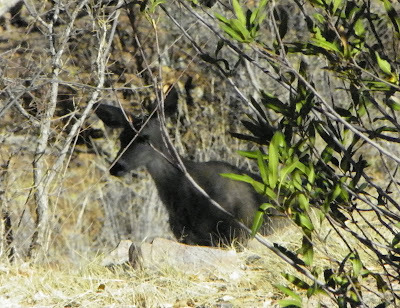 She moved down a small ravine to set up as the lookout while her youngster headed to my side of the drive. The youngster was very interested in something, but wanted to make sure that I posed no threat. 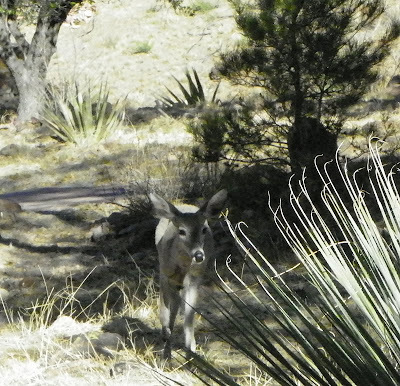 As he moved closer, the doe (a shadow in front of the small pine tree) came across the drive. I could not believe how close they were getting-- and neither showed any signs of stopping! ... until the young buck was standing behind a yucca just fifteen feet away from where I was sitting! Alas, I was not to find out just how close those deer would come. One of the owners' dogs came running up the drive, barking up a storm, and frightened them both away. Blast! I have to admit that I was so focused on the deer that when Rusty started barking, I jumped about a foot off my rocker! The last I saw of them, they were headed back over to the other side of the mountain. It was only then that I realized that I'd forgotten to breathe for the very few minutes they were there. What a special moment! Aww they are so cute, really nice photos of them. That does look a great place to be. shame about the dog! It's a wonderful place, Margaret. Anyone who visits Arizona should visit Bisbee (and stay at Mule Mountain Cottage and eat Bella Roma Pizza)! 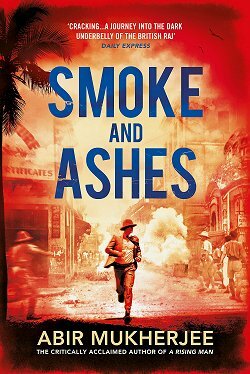 I love the shot of the one hiding behind the bush there. Wonderful! I think that's my favorite, too! Such a wonderful experience, and you were so lucky to get such great photos! I don't get that lucky very often, but I'm certainly glad this was one of those times! Cathy - Oh, what a rare treat you had! 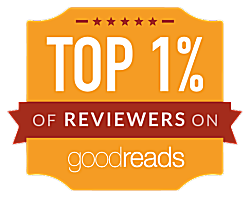 Thank you for sharing it with us :-). Little wonder you forgot to breathe for a minute. It's the type of moment I live for-- and they seem to happen with regularity down there. Amazing shots! It's so sweet how shy they are. I wonder if you'll see them with fawns next year? We go down in January and June, and neither seems to be the time to see fawns, unfortunately. Lovely visitors and fantastic shots. Wow! Amazing shots...and I really like the idea of your Observation Point with the tray of "supplies." You were bound to find some wonderful shots. A majority of the time, the key ingredient in all this is Patience. I don't always have it-- unless it concerns critters. That is exactly how I love to spend my mornings, a book, cup of tea and camera!! 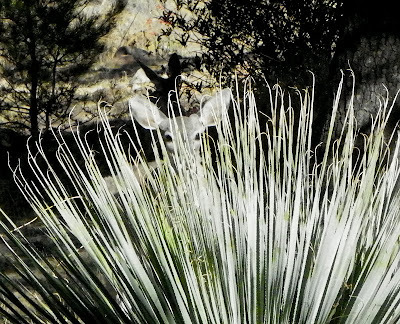 What great shots of the deer -- I love the one where he is behind the yucca! He was just about to move closer when the dog appeared on the scene. Drat! It sounds like Rusty startled everyone! What a treat to have the deer come that close to you! Wow, that must have been a wonderful moment. The photos are great, and you're so lucky to get to see things like this up close. Those are wonderful pictures! You had me laughing when you admitted how startled you were by the dog - I can imagine how completely caught up you were in the moment. I would have been, too! It's a wonder I had the presence of mind to keep my grip on the camera and keep shooting! Glad you enjoyed it! You got some good shots despite the dogs! One of the most delightful things about deer is how nosy they are. They will come breathtaking close to investigate a person who doesn't move. Too bad the dog scared them away. Great shots. I think the only moving parts on me during that time were my thumb on the zoom control and my index finger on the shutter release. I'm not used to dealing with deer, so I was determined not to do anything to frighten them. I'm very jealous of a whole morning in a rocker with a book and a glass of tea. You got some great shots. I still forget my camera sometimes. "big sigh"! I haven't forgotten my camera since the time Denis and I flew back east to Virginia and forgot ours. Talk about tragedy! Lucky you to see those beautiful creatures so close. You captured some great shots! You are SO lucky to get such close shots of the deers! Here is my Saturday Snapshot post! I'm glad you enjoyed them! 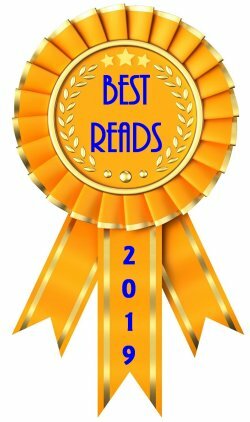 I loved reading your post today as well as seeing the pictures of the deer. Soooo sweet! We stayed in Friday Harbor for a couple of months once and the deer would come into the yard to eat the crabapples ... so long as we stayed out of sight. Friday Harbor is a beautiful area. Have you traveled to the other side of the island to check out Lime Kiln Point Lighthouse and the whale watching area? I'm glad I learned how to stay very very still when I was a child! These are great shots. DOn't think I've seen a mule deer before. 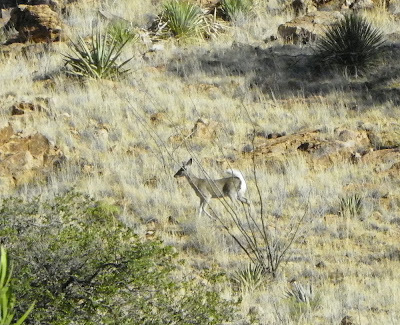 I may be wrong, but I think mule deer are Westerners for the most part. I'm not as familiar with them as I am with the habits of birds. What amazing shots! 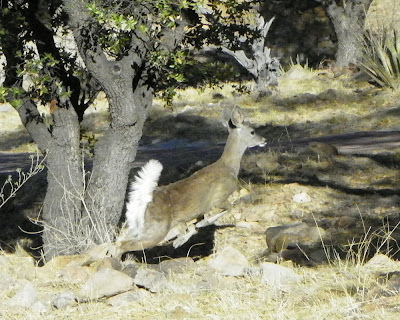 How exciting to get to see a deer, and great that you were able to capture the moment. My camera? I don't leave home without it-- especially when I go down to Bisbee! Beautiful shots! And yes, that's exactly how to get them. If you stalk them, they tend to run away. Wildlife are funny that way. I've gotten pretty good at suckering them into believing I'm engrossed in the book I'm reading. Erm... I hope none of them are reading these comments!! What beautiful pictures! I saw mule deer when we took our trip to the Rockies in 2006. 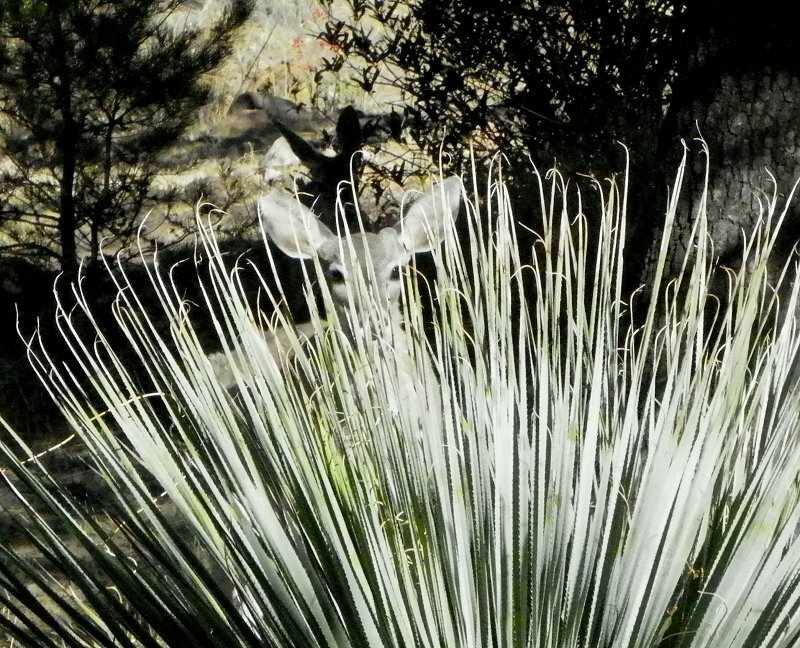 I love the shots of the buck peeking through the yucca plant and then leaping away. 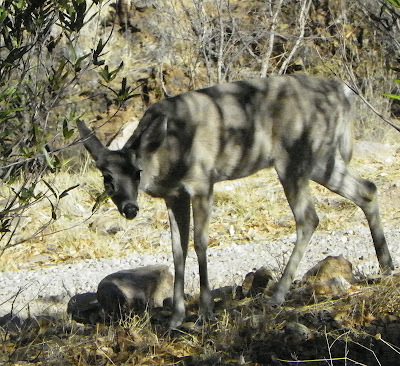 A memory firmly embedded in my mind is when we were taking our English niece to Kingman one spring, and there were large herds of pronghorn antelope on either side of the highway. Wish I'd been able to photograph that! Wonderful pictures. A good break from reading. My two favorite things to do: read and photograph wildlife! That looks like a fantastic way to relax and pass the time! I especially like the one of him in mid-jump as he's dashing away. Denis and I look forward to-- and cherish-- the two weeks we spend down there. Always a thrill to see wild life. Truly leads me to ponder...who is visiting whom? How awe inspiring to have a close encounter with wildlife like that. Thanks for sharing your photos. Lovely photos. Sounds like a wonderful time!